On most Wednesdays my young neighbor comes by for help with his homework and some games if time allows. 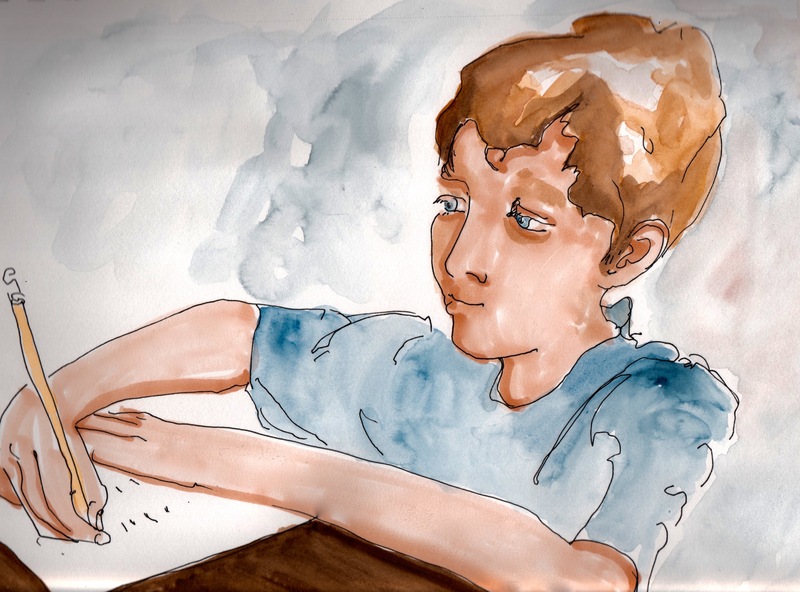 It takes such focus for him to complete his school assignment of writing each word five times that it gives me a lull in which to sketch him. At this point I have sketched him unsuccessfully a number of times. He is so blond that I have trouble finding defining features to draw. I am used to the dark lashes, brows, and glasses of my family members and much more at ease in conveying these with line and color. I continued to experiment with the anime/manga look and I used two shades of markers to try to give his fair skin some definition. I also used pen and watercolor. I think I caught something that shows his attention to forming each letter of each word correctly. This entry was posted in Facial Expression and tagged In- the- moment. Bookmark the permalink.